In just a few, very short days, it will be Thanksgiving! At this point, I hope you have planned out your menus and goodies! 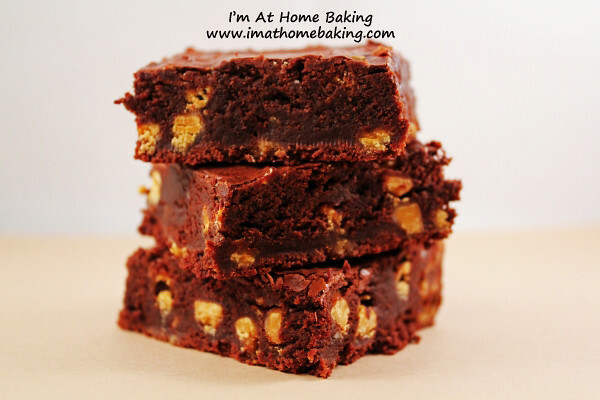 If you have some time to make up something else really quick though, I’d suggest adding these brownies to your lineup! They are delicious, very simple, quick to make and very pleasing to not only the eye but your mouth as well!! We will be celebrating our Thanksgiving by giving to others, our time, my baking, my husbands cooking. There are many single/unaccompanied sailors/airman on this base and so we want to try to make this holiday a little more enjoyable for them by making a homemade Thanksgiving feast! I hope you all have a fabulous holiday filled with lot’s of love, friendship, fellowship and of course food and baked goodies!! Position a rack in the lower third of the oven and preheat the oven to 325°F. Line the bottom and sides of an 8×8-inch square baking pan with parchment paper or foil, leaving an overhang on two opposite sides. Combine the butter, sugar, cocoa, and salt in a medium heatproof bowl and microwave for 1:30 minutes. Remove and stir until the butter is melted and the mixture is smooth. Set aside briefly until the mixture is only warm, not hot. It looks fairly gritty at this point, but don’t fret — it smoothes out once the eggs and flour are added. Stir in the vanilla with a wooden spoon. Add the eggs one at a time, stirring vigorously after each one. When the batter looks thick, shiny, and well blended, add the flour and stir until you cannot see it any longer, then beat vigorously for 40 strokes with the wooden spoon or a rubber spatula. Stir in the butterscotch chips, if using. Spread evenly in the lined pan. Bake until a toothpick plunged into the center emerges slightly moist with batter, 25 to 30 minutes. Let cool completely on a rack. Lift up the ends of the parchment or foil liner, and transfer the brownies to a cutting board. Cut into 16 or 25 squares. I printed off your brownie recipe to make this afternoon. Thanks for the post, look forward to a batch of brownies, maybe with a glob of ice cream, maybe not.